Today I decided to commit to working as a DM at Scuba Junkie for 6 months – until June. I resisted the idea at first – I’m meant to be traveling, not unpacking my bags. How can I write a blog called “the range life” if I’m not in motion? But such thinking is rigid and silly. Time to live life, and take the opportunities that present themselves. If I have found a place where I’m happy, where I can learn more about diving and about myself, what’s the point in rushing off? I always said this wander around the world would be free of rules, would conform to a plan only in the roughest sense. There are practical considerations as well, of course. First and most importantly, by committing to 6 months part of my “pay” will now include 4 cases of beer per month. An insane amount of beer. I’ll also build up a good number of guided dives, which will give me both experience and CV-filler that’ll make it easier to get a job elsewhere later. Finally, by settling down for a while – not planning and traveling and seeing stuff – I can continue to work on the backlog of writing I built up since I landed in St Petersburg more than 8 months ago. So, what is it I’ve been doing? Let’s start with a quick explanation of how the PADI system works. 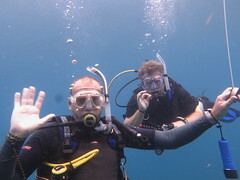 Divers-to-be must first take an Open Water diving course and become PADI-certified to dive. It’s only then that I can guide them – since I’m *not* an instructor (that requires more training), I can’t teach anyone to dive. Each day I’m assigned to a boat going to one of the islands in the Celebes Sea: Mabul, Kapalai, Sipadan, Sibuan, Mataking, Mantabuan, Siamil, etc. There are usually 2-3 divemasters assigned to each boat, and no more than 4 customers per DM. Once we get to our assigned island we choose which dive sites to go to – we do three dives per day, and each island has many dive sites. We take into consideration the experience level of the customers, whether they’ve dived the sites before, the conditions (current, weather, and so on), and also where we’ll see cool stuff. Next I give a dive briefing to my group of divers. 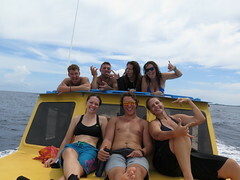 I describe the site, go through the hand signals we’ll use to communicate under water, establish how I want to run the dive, remind them of safety procedures, answer any questions, and tell them what kinds of marine life we’ll see. Dive, rest, repeat * 2. After the third dive we head back to Semporna, where the DMs offload the boat, rinse and put away all the gear, take a quick shower, and meet our customers at the bar to log the dives. I give them the stats from the dive (time in, dive time, maximum depth, etc.) and then list all the creatures we found – from white tip sharks to teeny whip-coral shrimp. 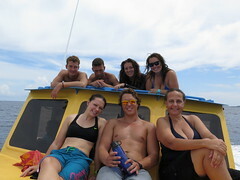 After that it’s back to the dive shop to set up the boats for the following day. Then a quick dinner, a beer or three, and off to bed. Sounds amazing. What a wonderful life. Have a great New Year! It sounds awesome indeed. Happy New Year from New Hampshire.